0 Comment January 19, 2019 Like? In this video, we are going to review two essential PTZOptics camera tools for Mac users. The first tool is our IP Address Settings Tool. This tool will allow you to search your local area network for a PTZOptics camera on your network and remotely configure your cameras IP settings. This is useful for quickly setting your PTZOptics camera to a static IP address or setting up the camera for DHCP functionality. The second tool we will review is the PTZOptics camera control software for Mac. This software provides intuitive PTZ camera controls for up to 8 IP connected cameras over your local area network. You can download the mac IP address settings tool at ptzoptics.com/downloads. The first time you open this application you may notice a security warning. If you see this warning you will need to access your systems Security and Privacy Settings and allow this app to be opened. Once you have opened this application, you can select your computers network interface card and press the search button. This should identify the cameras available on your local area network. If you are just about to set up a PTZOptics camera on your network you may find a camera with the default IP address of 192.168.100.88. We highly suggest that you set up a static IP address for this camera on the same range as your computer. Alternatively, you can set up your camera in DHCP mode where it will receive an available IP address from your DHCP enabled router. To set up a static IP address for your camera you can right-click a camera in this application and press “config”. Inside the configuration area, you can select a mode. Select the manual mode to set up a static IP Address. In the first text field, you should enter the cameras static IP address. Then you can enter the netmask, gateway, and First DNS. Once all of this information is set up correctly you can press the set button. You will see the camera reboot and once it’s done, the camera will have a new IP address. Now that our camera has a new IP address, let’s use the PTZOptics IP camera control software to take control of it. You can download this software at PTZOptics.com/Apps. Once installed you can open the application and enter your cameras IP address in the settings menu. You can enter the IP and name the camera in the IP settings area. Now we simply need to click the camera we have set up and take control. If you are looking for a video preview, try using the free Open Broadcaster Software app available for Mac at obsproject.com. 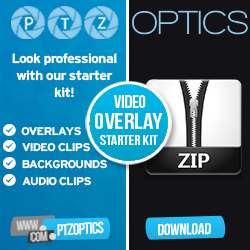 Let’s open up OBS and pull in an IP camera feed from our PTZOptics camera. To do this we will click on Media Source and uncheck all of the default boxes. In the input field enter RTSP://YOUR-CAMERAS-IP-ADDRESS/1. The slash one after the RTSP information tells OBS that you want to pull in the high definition stream. A slash two would tell OBS to pull in the standard definition stream. Depending on your network, the standard definition stream may work better for you.